If you are taking a walk along the circular Mall road, you will come across St. Andrew's Church. It was named after the patron saint of Scotland. The foundation stone of the church was laid on November 30, 1843. The church was badly damaged by an earthquake and had to be rebuilt in the year 1873. 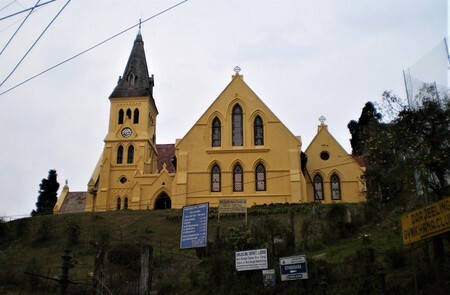 St. Andrew's is an old Anglican church and the early worshippers of the church included many Scottish soldiers and tea planters living in the Darjeeling Hill area. Inside the church there are inlaid marble tablets and brass plaques that memorialize some of the oldest residents of Darjeeling. One of the most prominent figures of those is the one of Lt. General Lloyd who was known as the "Discoverer" of Darjeeling. He came to Darjeeling in 1828 to sign a deed with Raja of Sikkim so that East India Company could get the administrative control over Darjeeling. He continued to live here and died in the year 1865. There is also a small brass plaque in memory of Charlotte Countess Canning who was the wife of the Governor General of that time of the Mutiny or the First War of Independence. She was a former Lady-in-Waiting or the personal assistant of Queen Victoria and was also an amateur artist. Charlotte came to Darjeeling in 1861 to take some rest and also to sketch the landscapes of the hills. On her way back, she stopped at the Terai (Siliguri area at the foothills) for few days to do some more sketching. Here unfortunately she contracted malaria. She was brought to Calcutta for treatment but died in few days. The church although looks a little un-maintained from outside, the ambience inside is really nice, quiet and spiritual. When I was approaching the church and looked at it from outside, I initially wondered if it was an abandoned building. It's not. Inside there is a provision to seat about 150 persons. Most of the people who attend regularly are local Nepalese. However you will find most of the seats generally empty though. Until 1995, the Old Cemetery of Darjeeling was under the jurisdiction of St. Andrew's Church. In 1970s, the church with the help of Das Studio made photographic records of all the graves in the cemetery. Strangely, the records have been misplaced and are missing since then. There is a regular Sunday morning service held at 9am between March and November and at 9:30am from December to February. All are welcome to attend. The Holy Communion Service is held on first and third Sunday of every month. The church also holds a Christmas Carol Service which is very popular and attended by many in the area. Pastor or the Minister in Charge is Ravi Rai, an Indian Nepalese. He has been holding the services since over 15 years. From the Chowrasta Mall, take the left Mall road. You can see St. Andrew's Church opposite to the Gorkha Ranga Manch and on a road going up towards the Darjeeling Tourist Lodge. Check out Darjeeling Map to see the location.